For those of you who love the glitz and glamour of a casino with a Las Vegas style vibe, then you’ll love Leo Vegas. Mobile Bingo Bonuses love how simple the site is to use and the large amount of games available, including Casino table classics, popular and featured slots and amazing progressive jackpots. The great news is that they have now introduced two more amazing slot games called Siberian Storm and Kitty Gitter Slots which we want to tell you more about. What adds to this sites allure is the fact that it’s available to use on most smart phone devices including Android, iPhone and Tablet devices. This means you can take the fun with you wherever you go and hopefully win a jackpot or two. Plenty of amazing casino table, slots and other games. Siberian Storm is an icy and snowy themed slot game brought by IGT which has photorealistic graphics of caves and giant cats of Siberia. With its unique 5 reel, 720 ways to win, novel hexagonal layout you’ll soon realise this is a great game to play. The more technical bits of the game include a scatter, stackable wilds, bonus spins and a multi-way Xtra reward feature; which all adds to the excitement! The wild can appear on the 2, 3 and 4 and will substitute any symbol to complete a winning lines. This wild option can also appear in stacks creating even bigger jackpots!! So if you like the sound of this frosty and stormy game then head to the link below and register with Leo Vegas. Kitty Gitter is for those of you out there who love their favourite companion, their cat. With cool kitty images, this 5 reel, 30 payline slot again brought by IGT means you could win up to 225 spins. With additional features of stacked symbols, scatter symbols, wild symbols, the diamond accumulator feature and spin bonus game, this is a really exciting slot game. If you are new to Leo Vegas then you’ll be glad to know that they have a fantastic welcome offer. 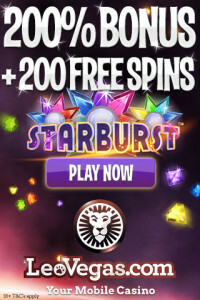 You’ll not only receive cash match bonuses on your first 4 deposits but they will also give you 200 spins on their favourite slot game Starburst. Making a total bonus of £700! So if you fancy playing these amazing games and taking advantage of this whopping welcome bonus, then simply head to Leo Vegas.